On 1 April 1275, Pope Gregory X approved the foundation. In 1562, the buildings were plundered and set on fire. In 1566 and again in 1578, about sixty nuns had to leave the Priory and seek refuge in Brussels. From 1713 there was a long period of peace and Val Duchesse could enjoy some prosperity. In May 1782, on Joseph II’s orders, the convent was closed and was later demolished in the aftermath of the French Revolution in 1796. 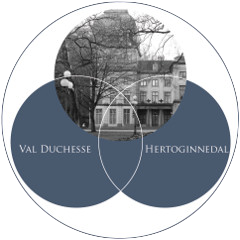 ON 21 October 1903, Charles Dietrich, an exchange broker and vice-consul for Norway, bought the splendid estate of Val Duchesse, in Auderghem, and turned it into a princely residence. Advised by architect De Vigne, he started by restoring and extending the castle, a specimen of the Louis XVI era. He had it rearranged, decorated and furnished with perfect taste. At the same time, with the assistance of landscape architect Louis Breydel, he turned its park into one of the most beautiful country estates in the surroundings of Brussels. Towards the end of his life, in 1910, King Leopold II decided to donate the numerous lands, castles and buildings that he had acquired over the past years to the Belgian nation. He made the donation on three conditions: lands and buildings were never to be sold; some had to retain their original function and appearance, and remain at the disposal of the heirs to the throne. At the present time, the Royal Trust is an autonomous public institution that has its own legal personality. It is completely independent financially: it is responsible for its own income and expenditure, and manages its assets and its personnel. When Charles Dietrich acquired the estate in 1903, only a wing, a part of the surrounding wall, and a few rural buildings still showed that the site had once been occupied. In 1915, Charles Dietrich entrusted architect Albert Roosenboom with rebuilding and extending the architectural compound. The hemicycle resting on six columns that constitute the entrance, the left-hand wing comprising the ground floor state room and the rooms on the first floor, all date from the time. The architect also built other secondary buildings to the right of the main entrance, and completed the works by an arch-shaped covered passageway. Behind the building, Charles Dietrich changed the old cemetery into a Renaissance-style compartment garden. The present-day castle is the result of numerous alterations over time and shows various architectural styles. The southern wing, in Louis XVI style, appears to be the oldest one (1780) and is believed to be a vestige of the old Priory built on Marie-Cécile de Neufforge’s initiative. Turning towards the park, we find a room in Louis XVI style, called the Golden Room, where the monograms of Charles Dietrich and Edmond De Vigne can be seen. To the right of the Golden Room, we find the Dutch room, which is covered with blue Delft ceramics tiles. The five lead glazed windows are each adorned with a roundel illustrating Jacobs Cats’ proverbs (a statesman born in 1577 in Brouwershaven, Dutch Zeeland). Across from the Golden Room, we find the library, or office, of Charles Dietrich, in the Flemish neo-Renaissance style. The cloth-lined walls are decorated with numerous motifs dedicated to the topic of fortune, a hint to the landlord’s money-trading profession. The fireplace overmantel is adorned with stars and bears the inscription “Posteo non sequor” . As a result of his gift to the Royal Donation, Charles Dietrich was conferred a personal baronial title, sporting the above motto. The latter literally translates as “I come after but I do not follow”, meaning in this case: “Though I came after the nuns of the convent, I took another course”. The Flemish Room is characterized by the oak paneling; the bays open towards the park and are adorned with stained glass panels illustrating the proverbs of fables of La Fontaine. A white stone arcade separated this room from the Gotic Room. In the drawings of architect Edmond De Vigne, the ground floor of this wing was designed as “a billiard room”. In 1956 and 1957 the Royal Trust made the castle available to the Intergovernmental conference on the Common Market and Euratom which brought together negotiators from France, Germany, Italy, Luxembourg, the Netherlands and Belgium. These meetings were important moments in the history of the European Union. Belgium played a key role in reconciling the different visions about the future of Europe. The meeting in Val-Duchesse, led by Paul-Henri Spaak, then Belgian Minister of Foreign Affairs, prepared the texts for the European treaties which were signed on 25 March 1957 and which founded the European Economic Community and Euratom.